Terasic - Terasic News Labs - News - Terasic Develops Breakthrough Medical Imaging System! Terasic News Labs News Terasic Develops Breakthrough Medical Imaging System! June 11th 2011 – Following a string of successful design cases, Terasic Technologies has delivered again! As the world’s premier electronics design service provider and manufacturer, Terasic has successfully co-designed and manufactured a complex multi-FPGA electronics support platform for medical imaging. 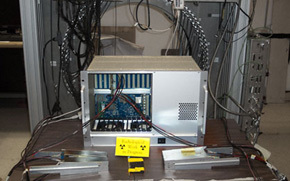 Known as OpenPET, scientists from the Lawrence Berkeley National Laboratory and senseL Corporation are undertaking a truly preeminent project for general purpose readout electronics for radionuclide imaging. The significance lies in the fact that the entire system is completely open-source, compounding the influence immensely. Briefly described, OpenPET consists of circuit boards, firmware, and software for researchers building prototype PET and SPECT imagers. Promoted as high performance, flexible, scalable, OpenPET is set to revolutionize medical imaging the same way all open-source missions has furthered the expansion of technology. To deliver on this massive goal of scalability which demands supporting up to thousands of detectors, OpenPET required the use of specialized IC chips known as FPGAs, which provide the immense benefit of re-programmability. To conquer this goal, Berkeley Labs enlisted the help of Terasic Technologies, a primary provider in FPGA development platforms throughout the world, to assist in developing the layout and manufacturing of these complex systems. With specifications including three Altera Cyclone III FPGAs, gigabit Ethernet interfaces, multiple memory features, 12 VME connectors, and more, Berkeley relied on the expertise and professionalism of Terasic to develop an intricate 20-layer board solution, all while under the pressure to complete in just 8 weeks. Figure 2. The Core - Multi-FPGA Electronics Support System. While most complex systems require multiple iterations to achieve a satisfactory state, Terasic was able to develop a flawless solution in the first instance. This top-notch result can be attributed to Terasic engineers’ constant attention to detail and upholding of the highest standards. “Failure is not an option,” states Terasic CEO Sean Peng. With another achievement to add to its track record, Terasic will continue to strive for continuous success and commitment in providing only the best service and quality to customers. "I would like to express my immense pleasure with the unbeatable service provided to us by the team at Terasic led by Mr. Sean Peng and Ms. Teresa Wei. Together we have developed a complex, 20 layer circuit board that included three FPGAs (each with ~600 pins), DRAM, SRAM, flash memory, ethernet, USB, RS-232, etc. In may ways, it was a multi-processor PC motherboard that used FPGAs instead of microprocessors. When we first contacted Terasic, we had completed the schematic for this board (we thought! ), but the tremendous number of nets on the board combined with the high connection density forced us to seek a vendor to do the layout, and the FPGA prototype boards produced by Terasic led us to enquire there. Terasic provided this layout service and much, much more. They performed a thorough review of the schematic that resulted in a number of changes and enhancements. They did the parts procurement, but coupled with this suggested alternate components that were either less expensive or easier to procure, and incorporated these parts into our schematic / layout. They fabricated and loaded the PCB, and also designed and fabricated additional boards that were used to test our board. Finally, they developed code to test and validate the intrinsic design and also to identify manufacturing flaws. In the end, we received circuit boards that passed all of the functional tests a mere six weeks after we sent the purchase order to Terasic. While this was less time than I had allocated for the first iteration of this design, the most significant savings came from the fact that we will not need to perform a second iteration, which I had also budgeted for. The extremely thorough checking performed by the Terasic team identified and corrected the design flaws that would have forced a second iteration, and so saved us many months and many thousands of dollars. There is no question that I would consider Terasic for further projects, and in fact, am about to request a quotation from them for another circuit board." As the leading FPGA system provider, we confidently offer customization services to world-leading companies and institutions. Our customized research, design, and manufacturing services benefit customers through shorter product development cycles, faster prototyping, and flexible manufacturing capacity.